Orlando International Airport is most definitely near most popular tourist destinations in Central Florida, mainly because of its many world famous theme parks. 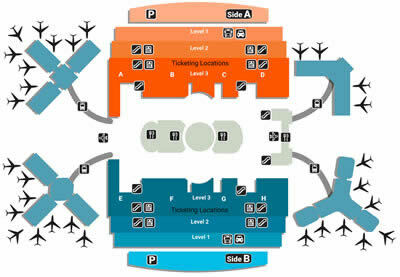 It is also a center for business as the Orlando convention center is widely popular amongst convention coordinators. Before you leave for your trip be sure to book discount reservations for airport shuttle in Orlando, taxi, sedans and limousine service to and from MCO airport. Once you take care of this detail your travels will much more enjoyable and you can breeze your way through the airport. One of the best ways to get to Central Florida is flying into Orlando International Airport. Located near International Drive and a short drive to Lake Buena Vista which includes vacation spots such as Walt Disney World travelers can take a break from it all with their families. Getting to your hotel or vacation resort has never been easier when you book your MCO airport transfer with providers at Mears Transportation and SuperShuttle or other local drivers who can pick up you in a shuttle, luxury limo or taxi service and get you to your destination quickly so you can kick back and start your adventure off right. Orlando is one of the most popular tourist destinations in the world, and it's not hard to see why. Getting from the airport to your hotel or theme park can be so much easier with SuperShuttle Blue Van or private car service. If you’ve ever travelled into or out of MCO airport before, chances are you’ve seen GO Mears Transportation vans lined up curbside outside of the baggage claim. GO Mears has long been Orlando International Airport’s answer to easy, fast, and reliable airport transportation. Shuttle rides for MCO airport can be easier and cheaper than most airports in America. With a wide variety of theme parks and hotels there is a lot to choose from when your flight lands in the Orlando area from shared ride vans that can take you almost any hotel in the Lake Buena Vista or Kissimmee near the theme parks. If your group is bigger than most then taking a private van all together may help reduce the overall cost of the shuttle ride. Mears Transportation is among the most popular airport transfer rides in Orlando including popular theme parks such as SeaWorld Orlando, Walt Disney World and Universal Studios Florida. After your flight arrives to MCO airport you can proceed to Terminal A, which is located at the Ground Transportation Level. You can combine your shuttle ride with other passengers with shared ride vans provided by SuperShuttle and Mears Transportation. Group rides for The Orlando Convention Center is easier with seating for up to 12 passengers per van. Corporate accounts can book professional sedan trips with ExecuCar provided by SuperShuttlecluding Blacklane. Rides with a personable touch are available throughout the Orlando and theme park areas near Universal. MCO airport rides to Altamonte Springs and surrounding cities such as Maitland can be in style with private SUV's for a more direct transfer to your destination. Get a cab ride to for long distances such as Sanford or closer areas at Winter Park or downtown Orlando. Chauffeured limo rides with First Choice Limo Service, Orlando Vintage Limo and Metropolis Services offer luxurious limousine transfers to MCO airport. Take group rides on buses that can transport up to 52 passengers to theme parks and attractions in Kissimmee as well as International Drive. You can use our map to assist you with finding the general location of your driver in the terminal at MCO along with the instructions located in your email confirmation. At MCO airport you’ll find providers like SuperShuttle Orlando and Mears Transportation who both offer shared ride vans and taxicabs for passengers that arrive at MCO. Alternatively you can travel by ExecuCar which is a sedan chauffeured transfer service provided by SuperShuttle. Mears Transportation is a popular provider if you are going to be visiting Disney World. From here Disney’s Magical Express can take you to all of Disney’s hotels and resorts. SuperShuttle offers regular shared ride and private van services for travelers seeking a cost effective and popular way to get around the downtown Orlando and suburban areas. Before you fly into town you can book your shuttle van reservations for Orlando surrounding neighborhoods through well-known services such as Blue Van which is easily recognized as SuperShuttle can be easily be made online. As being one of the largest cities in Florida with dozens of major theme parks and attractions airport transportation becomes important as the many Orlando things to do and area receives millions travelers per year making airport transfers a vital part of getting vacationers around while they are in town. In Orlando you can expect to find some of the most unique hotel accommodations from the best luxury resorts while you can find many cheap or budget shuttle transfers to get you there. Some of the most popular destinations for travelers making Orlando hotel reservations are the Peabody hotel and the Gaylord Hotel. At AirportShuttles.com you can book your Orlando airport shuttle reservations to theme park hotels conveniently in one place. SuperShuttle Orlando provides airport pickup rides for travelers needing shuttle transfers, stretched limousine and bus charter rides to theme park hotels plus resorts and especially Disney World. Mears Transportation is also a great choice for cruise transport, which is about two hours from Orlando MCO Airport. Orlando is one of the largest cities in Florida and is home to dozens of theme parks. Not to mention the fact that Central Florida also has some of the best-known tourist spots in the United States such as the University of Central Florida UCF, which is why it is important to find airport transportation that is, reliable so you can get to where you need to go easily. Is there a shuttle from Orlando Airport to Universal Studios? Yes. The cost can range per vehicle type such as a shared ride ride and can start around $26 when you travel from MCO to Universal Studios. The trip is roughly 17 miles along FL-528 W/FL-528 Toll W and travel time can depend on the time of day you travel since these roads are very busy throughout the day. How much is a shuttle from Orlando airport to Disney? Prices for MCO to Walt Disney World Resort can start at $33 with a distance of about 26 miles for the trip. How far is Port Canaveral from Orlando Airport? Port Canaveral is about 45 miles from MCO airport when you take FL-528 W.
Finding Orlando hotel transportation from the MCO airport is easy. After you book your shuttle reservation take your confirmation to the shuttle desk located in the ground transportation of the airport. There you can board your shuttle bus and you will be taken to your hotel whether it is downtown or in the metro areas. The Hyatt Regency Orlando International is located inside of the airport terminal providing travelers with a convenient place to stay. Your luggage is collected at baggage claim and delivered directly to your hotel room. You can find rates for anyone’s budget needing private vans or transfer services to your accommodations near the convention center or resorts. Passengers traveling through the Orlando have never been easier. You can learn more about the museum, theme parks and beaches that surround the area from Disney to Daytona Beach. Orlando International Airport is one of the biggest airports in Florida also known as MCO airport, which services the central Florida area. Located in Orange County near downtown Orlando it has plenty of shuttle providers to transfers you to places such as Aloft Orlando Hotel or The Florida Hotel & Conference Center. Orlando is home to dozens of theme parks and attractions and offers a lot more than just thrill rides such as NASCAR racing, space center and beaches. There is always something for every one of all ages in Florida. The Arboretum at the University of Central Florida may be a different vacation spot for some but is worth visiting. If you are looking for shopping the Florida Mall is the largest mall in Orlando and has hundreds of places for you to shop while in town. Besides being a major tourist destination Orlando is also a hotspot for businesses and conventions. The Orlando Convention Center hosts exhibitors and event planners worldwide. If you are looking to visit “Old Orlando” located in the downtown Orlando area you will find many restaurants and things to do along with Church Street. The Orlando metropolitan is in Orange County and is the one of the best known tourist spot in the world with theme parks and attractions such as the world famous Walt Disney World, Epcot Center, MGM Studios, Animal Kingdom, Universal Studios Florida and Universal’s Islands of Adventure. Traveling through Orlando has never been easier. Learn more about the various area and destination to visit from the Disney area to Daytona Beach. Orlando is close to many of Florida’s most popular destinations such as Hollywood Studios, Disney’s Magic Kingdom and SeaWorld. You can find shuttle rides for many of the theme parks in Florida. As travelers arrive in each area booking rides to and from your destination can help make your trip easier and less stressful. Travelers can discover the many types of vehicles they can book for rides to and from MCO airport. From shared ride vans to luxury black cars such as limos and sedans tourists can find a large variety to ride in. Explore the Orlando area and have an adventure with your family at one of the many theme parks this city has to offer. You will thoroughly enjoy your stay here. To get started on your planning take a look at these travel tips.